Home|Floral Library|Jungle Geranium – Ixora spp. Decorative Life: From 4-6 weeks. Member of the Rubiaceae (madder family). Native to India and surrounding area. Common relatives include galium, sweet-woodruff, coffee and gardenia. Flowers are tubular opening to 4-5 spreading lobes, in tight clusters at stem ends. Stems are often woody, leaves leathery. Ixora, a Malabar deity to whom the flowers were offered. 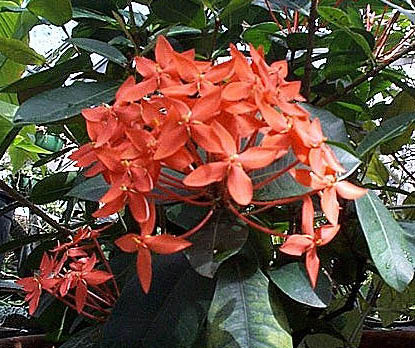 There are many forms of Ixora under various Latin names, thus complicating an understanding of this species. Besides ornamentals, this family includes a number of important species noted for coffee, quinine, dyes and medicines. Will generally do well in light levels at least bright enough to read a newspaper in comfort. The reported dwarf species I. taiwanensis could not be confirmed in taxonomic journals. Meir et al. (1994) reports that a synthetic auxin, NAA, greatly reduced or even prevented leaf abscission when plants were sprayed prior to exposure to chill inducing temperatures. In a later report (Michaeli et al., 1999), MCP was also shown to inhibit leaf abscission caused by chilling.